They call it the Great White North. Fortunately it’s summer, so it’s green, green, green. In the east it’s warm. Canada has just woken from its winter slumber. The streets have survived the ice, snow, salt, sand and the melt. The cars have received another lawyer of rust, and the roads a few more cracks and potholes. As my brother-in-law commented, this is the construction season. The mad rush to build, construct and repair roads, before the weather turns and the ground re-freezes. The street scape is a mass of scaffolding, gardens are being replanted, and every road is being repaired. Fresh spring blooms, pale uncovered bodies and traffic chaos. The freeways are ‘carparks’, the parks a verdant oasis of porcelain bodies, and Toronto’s cityscape a skyline of cranes. Our 33rd floor apartment provides a vista of Toronto, punctuated by the CN Tower, still the world’s third-tallest structure. Lake Ontario in front, by day sparkling blue, and by night a dark mass with the far-away lights of the US twinkling on the distant shore. 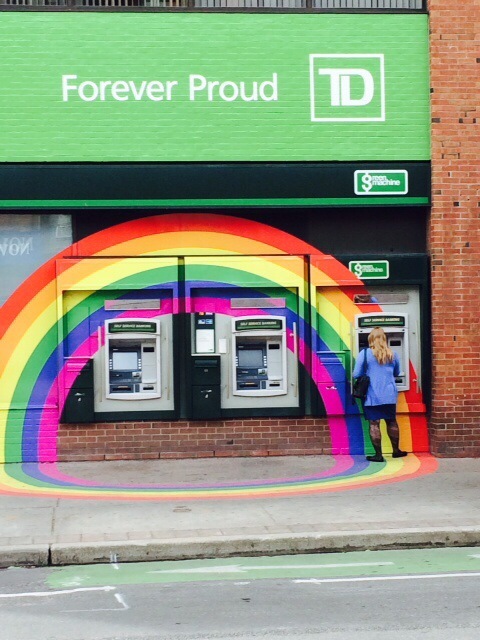 Toronto is hosting World Pride 2014 next week, so the city is a resplendent with rainbow flags. No one is afraid to display their support for something different. No thoughts or cares about what the shareholders or voters would think. The banks, city council, restaurants, departments stores and public buildings are a prism of colour. Don’t worry, I’m not going to don my stilettos and bash you over the head with my handbag (I have a man-bag anyway). It’s just interesting to be in a country where it just isn’t even relevant. I won’t bore you with the usual flight plan of long, long flights from Perth to Sydney to Los Angeles to Toronto. Let’s just say that besides Business Class – thank you, Qantas 🙂 – 30 hours later, I stank, was tired, crotchety and needed to sleep. The usual story for previous readers of my blogs. I have young bones and joints. How my seventy-plus and eighty-plus year old parents coped is amazing. I’m used to passing through LAX airport and US immigration’s warm and effusive welcome (for US readers: ask someone to explain sarcasm to you) when jet-lagged and vulnerable. My parents handled the process of immigration and lugging suitcases between terminals like seasoned pros. 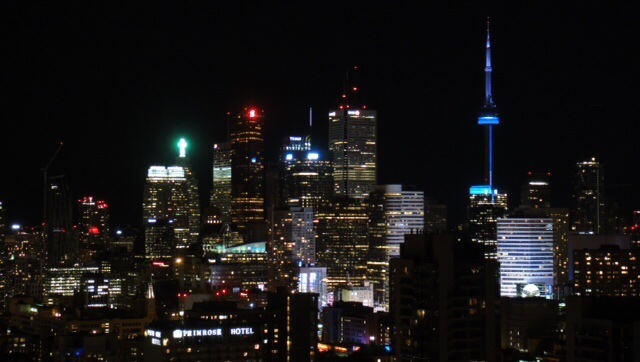 Toronto was a sleep-deprived blur of family, sights and city. We explored the older side of Toronto, historic streetscapes and ivy-covered three-storey Victorian mansions; the waterfront of Lake Ontario; art galleries; a personal tour of Osgoode Hall, the first and oldest law society in North America; and perhaps the odd bit of retail therapy at the Eaton Centre. Well, we are lucky enough to have spent five days disrupting the life of my very patient brother- and sister-in-law and their energetic and adorable children. We even spent the day at their local street festival with our niece and nephew. Face painting, balloons, popcorn and music. Note to Self: Tie the helium balloon to the pram next time. I never want to be responsible for that look of bewilderment, loss and that quivering bottom lip – mine, not my niece’s; my niece is made of sterner stuff. They were even kind enough to put on a BBQ with friends that we haven’t seen for years. To say that my in-laws were generous with their time and kindness is an understatement. BTW, we promise to return your BMW in a few weeks. I’m loving the drive, but the driver’s seat is on the wrong side for an Aussie. Thank god for the smooth ride, because not content with pushing ourselves with long distance flights, we added a ten and a half hour drive. Toronto to Quebec City to Baie-St-Paul. We hit the tarmac at seven in the morning and motored 800 km northeast through fields of wildflowers, weathered wooden barns and copses of conifers, poplar and silver birch. Australian readers will appreciate this: Lush green, dark green, light green, variegated green. Not an inch of brown dry earth. A “heads up” to Québécois drivers: When travelling at 140 km/h with only a thirty centimetre gap between you and the next car – it’s not going to end well. 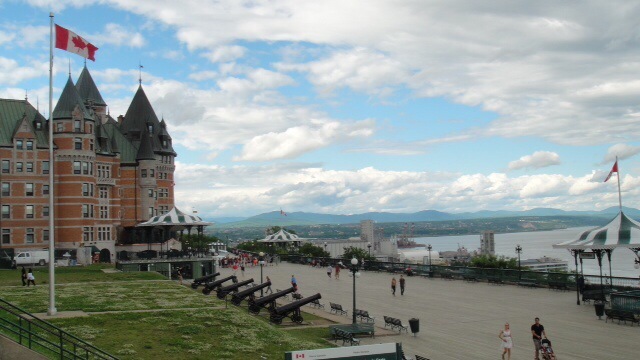 At five-thirty in the afternoon, we negotiated the historic and cobbled streets of Quebec City. As a Mike and I have already spent time in the French Canadian capital, we dropped my parents off for a few days and drove further north to the Charlevoix Region and a small town on the edge of the St Lawrence River, to a hotel Mike found which is a mix of industrial chic and vintage French ski chalet. A confusing melange, but it works extremely well. They even have game on the menu. After seeing all the roadside moose warning signs, I had an appetite for some Canadian critters. All road kill of course. Little more interesting then the usual bloated kangaroo you find lying on Australia’s country highways and byways. Time to practise my French, and digest some wildlife in Hotel la Ferme’s restaurant. This entry was posted in Canada and tagged Baie-St-Paul, Canada, Charlevoix, Quebec City, Toronto. Bookmark the permalink. Finally, it’s good to hear that you haven’t abandoned your avid blog readers. Keep it going….